Conscience began in 1980, before NWTRCC was founded in 1982, and lasted in one form or another through 2007. I have most of the issues between #22 and #52 in my possession, spanning 1986 through 2001. This publication is an absolutely fascinating snapshot of the topics that animated war tax resisters and peace tax fund supporters at the time. I plan to write several more blog posts about things I’m reading in Conscience, so stay tuned for more Conscience and History subjects, including coverage of the tax resistance in Beit Sahour, other nuggets of NWTRCC history, and the major debates within the war tax resistance movement. Click to see large version of the article. 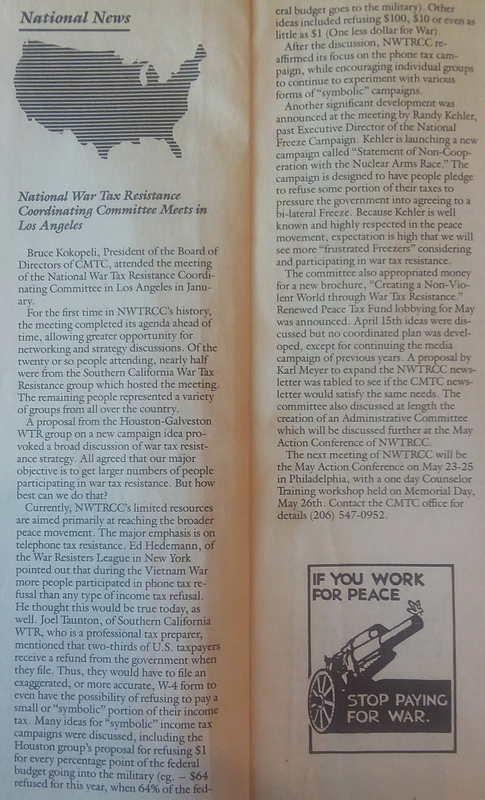 The article also notes, “Of the twenty or so people attending, nearly half were from the Southern California War Tax Resistance group which hosted the meeting. The remaining people represented a variety of groups from all over the country.” Our LA meeting this May was attended by a larger group, including the Friday night event with attendance of over 40, including many local folks. NWTRCC events have never been large, per se, but I’m at least pleased to see that we aren’t shrinking in attendance. The article notes that by January 1986, NWTRCC was beginning to explore creating an Administrative Committee, which is today a main source of decision-making support for NWTRCC consultants. The primary focus within NWTRCC at this time was on telephone tax resistance, an issue that occupies relatively little time today due to changing phone technology and taxation (it only applies to local landline service). However, we still have information on our website for those who wish to refuse the federal excise tax on local landlines. Resisters active in NWTRCC at this time and mentioned in the article included Ed Hedemann, Randy Kehler, and Karl Meyer. At the time, NWTRCC was also considering expanding its Network News newsletter, but wasn’t sure if there was too much overlap between Conscience and Network News that would make this expansion redundant. Eventually, however, NWTRCC’s newsletter became the only periodical primarily covering war tax resistance, and that’s still true today. P.S. I also enjoyed this picture from Elizabeth Richter in the issue’s letters section. 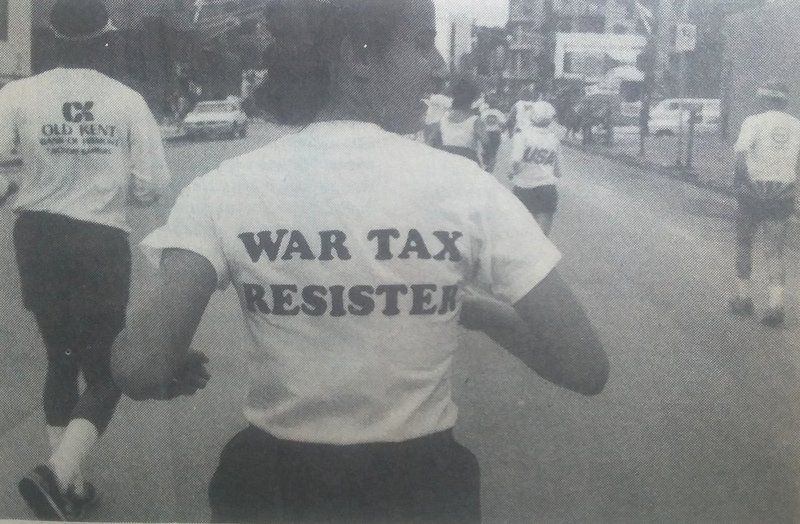 She ran the 1985 Chicago Marathon in a shirt that said “War Tax Resister” on the back. I was involved in creating many of the early CMTC newsletters. They were a major undertaking and were printed in the thousands in News friend and contained a wide variety of peace and justice news and views. The CMTC Came into being before computers were very common. We had a father and son team on Long Island hand assemble A computer that used floppy disks that were about 10 inches wide. The motivation for creating the computer was because we expected to have a mailing list that exceeded most of the limitations on other types of equipment. We called the computer HAL which had nothing to do with the famous movie but due to the fact that the creators were named Hal and Larry. The CMTC received a good deal of mail And the daily Mail call was a highlight. Ed Pearson the creator of the organization receive the mail and culled through it. Then he passed it on to Kathy Levine and I who diligently processed it. We used to respond personally to many of the letters which regularly surprised people who were used to sending off to nameless and faceless organizations and getting no feedback. The money that was deposited in the escrow account was mostly invested in certificate of deposit’s in local banks. The interest on the account was relatively substantial. Some people The money that was deposited in the escrow account was mostly invested in certificate of deposits in local banks. The interest on the account was relatively substantial. Some people May remember that interest rates in the 1980s was in the teens and banks offered significant rewards for people opening savings accounts. The “staff“ of the CMTC that assembled the periodic newsletter was called KEGL which was the initials of our first names. when Kathy Levine became the first coordinator of NWTCC, she worked out of the CMTC office which was a converted garage behind the house that we lived in in Bellport New York. I am delighted to hear that back copies of the CMTC newsletters still exist. I hope they will end up in the Swarthmore College Peace archives. 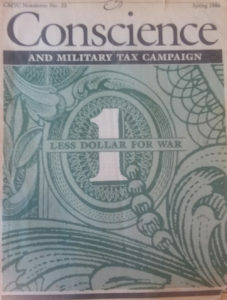 I remember years ago seeing a stack of them also at the offices of the national campaign for a peace tax fund in Washington DC. My job at the CMTC in the 1980s was my first paid job in the peace movement. Kathy Levine and I moved from Virginia to Bellport Long Island New York to work for this organization whose goal was to get 100,000 people to pledge to resist taxes simultaneously in support of the congressional legislation for a peace tax fund. 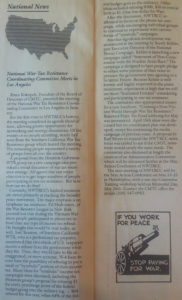 The newsletter was printed by the thousand a Newsprint and reached Many many people in the peace and justice movement. The daily Mail call was a highlight of this organizational work. The mail came to the home of Ed Pearson the founder of the organization and after culling through it he would bring it over to the nearby office which was a garage behind the home where Kathy and I lived. There were always new pledges and we constantly added names to our mailing list on our homemade computer that was specially built by a couple of local guys to support a large mailing list. This was before computers were very common and not available commercially. We responded to a lot of the mail personally which surprised a lot of people since they were not used to getting personalized responses from nameless and faceless organizations. The creators of the CMTC newsletter were known as KEGL, The initials of the CMTC staff Kathy Ed Georgia and Larry.